The subjoined is a view from the Terrace of Mr. Metcalfe’s House of a portion of the Palace of Dehly built by the Emperor Shah Jahan and of the Pattan Fortress of Suleem Gurh, constructed by the Emperor Suleem Shah, son of the Pattan adventurer Shere Shah by whom the Moghul Emperor Hoomaioon was temporarily expelled from the throne of Dehly. The latter must have been built about the year 1539. The Bridge connecting the two, although in some degree assimilating to the Patan style of architecture, was built by the Emperor Shah Jahan at the same time with the Palace. The name Saleem Garh being associated with recollections derogatory to the dignity of the Imperial House of Timour, is never mentioned in the Royal presence or used in correspondence to and from His Majesty, that of Noor Garh or the Fortress of Light being substituted. N.B. In this I am incorrect. I have lately seen the inscription on the Bridge to the purport that it was built by the Emperor Jahangeer (Conqueror of the World) the Father of the Emperor Shah Jahan about the year AD1607. Inscribed: naqsha-i tripoliya va salimgarh va qil‘a-i shahjahanabad. Mazhar ‘Ali Khan. The Emperor Bahadur Shah. The Prince Aboo Zafr or the Victorious was the eldest son of the late Emperor Mohumud Ukbar Shah the 2nd, born in the year AD 1773, and ascended to the fallen Dignity of the once mighty House of Timour on the 29th September 1837. His father having demised at the Kootoob late in the evening, it was necessary to await the arrival thence of the several Emblems of Royalty before the Installation of the Successor could take place. It was therefore Midnight when the Ceremony was performed by the Agent to the Governor-General in the Tusbeeh Khana or Oratory adjoining the great Hall of Audience. The Prince on his accession assumed the style and title of Buhadur Shah. He is mild and talented but lamentably weak and vacillating and impressed with very Erroneous Notions of his own importance, productive of great Mortification to himself and occasionally of much trouble to the Local Authorities. Inscribed above: Abu Zafar Siraj al-Din Muhammad Bahadur Shah Padshah Ghazi. 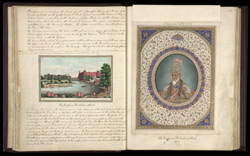 Inscribed below: The Emperor Bahadoor Shah 1844.